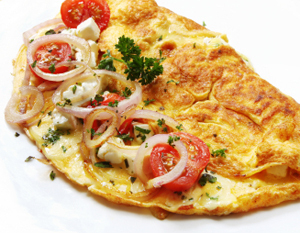 We start most days with an omelette. It contains 2 eggs, thickened cream, 1/2 slice of diced bacon, 1/4 diced onion, 2 diced mushrooms, 1/2 diced zucchini, 1/2 diced tomato, all cooked in lots of butter and served on a bed of beautiful baby spinach. We do not even begin to feel peckish again until almost 3 o'clock in the afternoon, at which time we might have a piece of fruit, a handful of nuts or a low-carb muffin just to tide us over until dinner time. Most of our dinners are simply a serve of meat cooked in either butter or baked in it's own fat accompanied by a range of different vegetables from the Food Pyramid. A favourite of ours is mashed cauliflower (see recipes), and the kids LOVE it! It is all simple but very tasty food that keeps us satiated for long periods of time. The thing about carbs is that they make you hungry again within a very short space of time. Fat does not. Ever wonder why you're starving by 10am after your bowl of cereal in the morning, or an hour after you've eaten chinese? A LCHF diet will keep your blood sugar levels even for hours on end. You'll no longer feel the urge to have that afternoon nannanap just to keep you going to the end of the day. When you eat food that is high in carbs your blood sugar will go through the roof shortly after eating it but then it will take a drastic drop, way below what it should, until you feed yourself again.